'Even the biographical individual is a social category', wrote Adorno. ‘It can only be defined in a living context together with others.’ In this major new biography, Stefan Müller-Doohm turns this maxim back on Adorno himself and provides a rich and comprehensive account of the life and work of one of the most brilliant minds of the twentieth century. 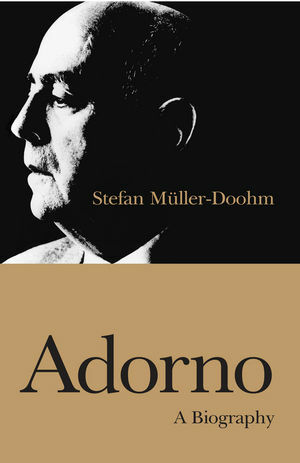 Müller-Doohm's clear prose succeeds in making accessible some of the most complex areas of Adorno's thought. This outstanding biography will be the standard work on Adorno for years to come. Stefan Müller-Doohm isProfessor of Sociology at Oldenburg University, Germany. "Although Adorno died in 1969, we have had to wait more than thirty years for a biography ... Stefan Müller-Doohm’s is the most detailed and probably the best. (It has been exceptionally well translated, too.)" "Stands as a very informative account of Adorno’s life, which has much to offer casual readers of Adorno and those with a thorough interest in his work [and] ties a narrative description of Adorno’s life to a sensitive understanding of his thought, and of the consistency of his reflection across the different disciplinary boundaries that it traversed ... This book does all the things a biography should." "Exhaustively researched and presented with exemplary balance, Müller-Doohm’s re-creation of Adorno’s 'damaged life' is fully worthy of its demanding subject. No future student of one of the twentieth century’s most influential thinkers will be able to ignore this remarkable achievement in intellectual biography." This is the first major intellectual biography of Adorno, one of the most influential thinkers of the twentieth century, that brings together for the first time his work, life, and historical context. Based on some of the latest research on Adorno’s life and work and on an array of sources including Adorno’s personal letters, interviews, notes and other writings. An in-depth biography covering Adorno’s entire life and the full range of writings on music theory, literary criticism, cultural criticism, philosophy, and sociology. Written in an accessible, engaging style.